Is a Dogo Argentino a Pitbull ? Although the Dogo Argentino has a similar face structure to those of a Pit Bull’s, they are not a Pit Bull mixed breed at all. The Dogo is a Mastiff breed otherwise called the Argentine Mastiff. It is a breed developed by Dr. Antonio Nores Martinez in the year 1928. It is however true that the Dogo is comprised of many other breeds in their creation. About ten breeds of dogs make up the Dogo’s genetics and they are the Bull Terrier, Irish Wolfhound, Pointer, Dogue De Boreaux, Great Dane, Bull Dog, Great Pyrenees, Spanish Mastiff, Boxer and the now extinct Cordoba. Is a Dogo Argentino a PitBull question has been asked by many canine fans so I just wanted to make it clear to you all here. The Dogo is not a Pit Bull mix as many have misunderstood, they are much larger than a Pit Bull, share a unique white coat and differ in personality and temperament. It is very important for this breed to be recognized as a breed of their own so they are not looked down upon. Pit Bull’s carry an unnecessary bad rep among the public for very stupid reasons. As a Dogo Argentino enthusiast it was very important for me to write this article and point out to the public that the Dogo isn’t a Pit Bull and they are two very different breeds. The Argentine Mastiff stands twenty four to twenty seven inches in height and weighs up to 120 pounds. Females are a bit shorter and weigh less than males. The most distinct feature about them is their beautiful all white short coat. 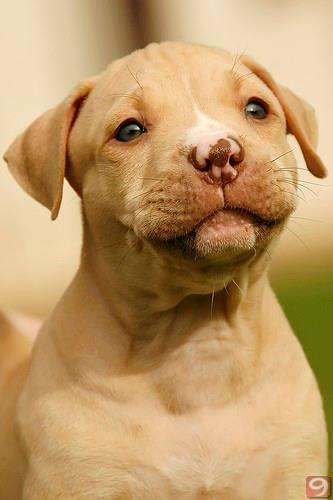 Some Dogo’s may have black patches in their face or around their eyes. Dogo’s can live up to twelve years and they are very healthy for a large breed dog. They require a exercise and will do OK in apartments if exercised everyday. Dogo’s are perfected to be a hunter, they will hold down the hunt till the master arrives. The Dogo has a gentle temperament toward family, they especially love kids. Dogo’s ears and tails can be cropped or docked which will help them in the hunting process, the ears are a dog’s weak spot and it can be quite painful if a prey was to strike it. The real American Pit Bull Terriers are a bully breed of dog’s that shouldn’t weigh more than 50 pounds, however there are variance within the Pit Bull family such as Staffordshire Terriers and American Bully’s. Staffordshire Terriers and American Bully’s can weight more than a real American Pit Bull Terrier. Pit Bull’s normally doesn’t get taller than twenty four inches. Pit Bull’s are also very healthy breeds with a lifespan of 13 years and more. Unlike Dogo’s Pit Bull’s come in a variety of colors and sizes. Pit Bull’s lack hunting instincts like the the Argentine Mastiff, Pit Bulls can however work great along side of law enforcement and military. Similar to Dogo, Pit Bull ears are sometimes cropped today due to aesthetic reasons. Pit Bull’s ears were once cropped when dog fighting was big to give them an edge in the fight. I however dislike ear cropping altogether, I think a Pit Bull’s ears look adorable not cropped. To sum up the Is a Dogo Argentino a PitBull? question: A Dogo Argentino and Pit Bull vary in many levels. Their energy levels are different as well, Pit Bulls have greater endurance than a Dogo for their small size. Pit Bull’s however doesn’t come close to Dogo in size, strength and in the ability to be a hunter. I must correct you when you say pitbull is a breed. Pitbull is a classification of many breeds and mixes of these breeds. 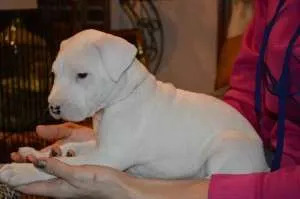 American Pit Bull Terrier, American Bull Terrier, Stattfordshire Terrier, Bull Dog, English Bulldog, American Bull Dog, French Bull Dog, Dogo Argentino, along will many other breeds and mixes of these breeds are all classified as Pitbulls, but are their own breed individually. So again a PitBull is not a breed, but rather a classification of many breeds and mixes with the classic similar characteristics, build and strong jaw and head. Many people do not know this as a pitbull has now become common when referring to a dog that looks like a dog classified as a pit. This is completely false. When people use “Pit bull” your mind should automatically go to the American Pit bull Terrier. That is the only pit bull. That is the breed. The other dogs you mentioned are their own separate breeds and are in no way related. I mean c’mon…the only ones to get mixed up with the pit bull are staffies, dogos, corsos and canerios…and that’s only because they look alike to the untrained eye. How tall and how much is a female Dogo? About a year and a half ago, I had a white dog, skin and bones, show up at my doorsteps. I took her in, fed her and took care of her… Have been ever since. I have been told by one vet that she was all pit, but another vet in the same office told me she was a white boxer. Others have suggested she is American bulldog. 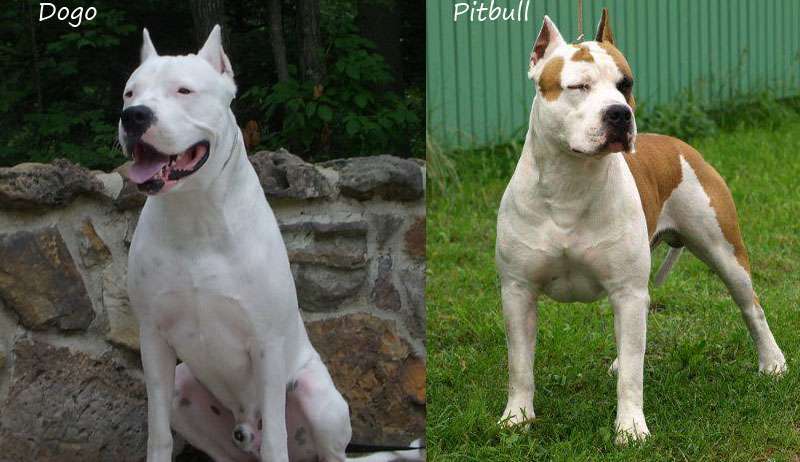 All of these dogs have similar features, but to me, she resembles the Dogo Argentino more than she does the others. Hi Chere, I am glad that you took her in and took care of her. Most people today will just return her to the pound. A female Dogo will be around 23 to 25 inches in height at the withers. If you can post some pictures of her in our forums or our group on facebook I can give you some ideas. Thanks for visiting our website, have a happy New Year! I think my dog is a Dogo, how can I find out? I have to say I strongly disagree with the statement that APBT’s having more endurance. Dogos were bred to have stamina for hunting; the only dogs to match my Dogo in stamina are other Dogos (though he gets along wonderfully with all types of other dogs). He and his Dogo buddies will go at it for 5+ hours nonstop..I’ve yet to see a pitty playmate keep up with that. As someone who has lived in an apartment with a Dogo, I really do not recommend it unless the Dogo is taken to the dog park or a daycare 4 or more days a week, AND ran at least 2 miles a day. APBT’s seem to get along much better in an apartment, and they are for the most part more easygoing than Dogos. I cannot stress this enough, Dogos are NOT for everyone; they are stubborn, dominant, very strong, and their exercise requirements surpass most, if not all other breeds. They are a working breed and should be treated as such. As much as some people think dogs shouldn’t be ‘forced’ to work..Dogos crave it and they will be unhappy as a couch dog (except perhaps a senior Dogo). I will never go without Dogos in my life! I stumbled here looking for information on my dogs trying to identify their breed. I know they are mixes and not full, but they are from the same litter and I also have access to another dog from the same litter. 2 of them are white, 1 male, 1 female, but then I have a full brindle female. I read on the akc site that Dogos can have a thin enough coat that you can see the spots on the skin, which is the case with my male. They are barely going to be 2 years old and the mother was a brindle “pit bull” but we were unsure of the stud, although they claimed it was one of their male pits, none of the puppies in the litter resemble any of their males. I would be happy to send pictures. 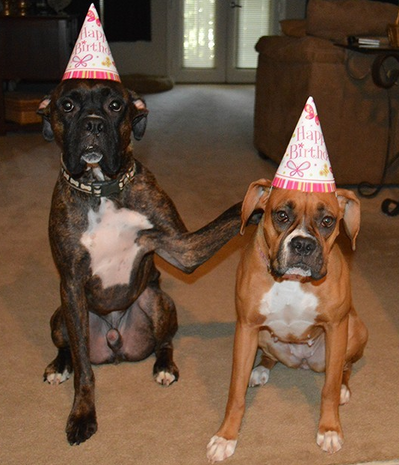 My question is, is it possible to get 2 Dogos and something else out of a couple of pit bulls? Did the DNA just happen to line up right? Unless the male was a dogo, or one of the parents has dogo ancestry, they are not considered dogo at all. Some of the breeds used in the creation of the dogo are found in the ancestry of the APBT. The Martinez brothers started in the 20’s and spent many years of hard work perfecting the dogo, incorporating 10 breeds with the foundation breed, the Cordoban fighting dog. Each breed that went into the making of Dogo Argentinos were carefully chosen to enhance a specific trait. In short, it is impossible to have an accidental Dogo. Quick question breeding a dogo with a XXL bully has it ever been done? Grandson has dogo…noticed my wall’s chewed, now replacing fence outside. Lots of chewing. I told him the dog has to go. Help. Argentine Mastiff is a misnomer. The breed founder was a dogman and a Professer and surgeon. “Dogo” is a type of body in the mollaser group, as is “mastiff”. They are called a mastiff only in the US, where most dog standards are watered down and typically far from the more technical information and wording used in in International Canine Federation standards. Also dogos tails are not docked. We are looking at adopting a Dogo/Great Dane mix puppy. I have 3 kids, all teens and very active. We have acreage for him to run also. I read a couple of the posts and was just wondering 1-how big will he actually get and 2-if trained from a young age, how “stubborn” or “dominant” he will be? Thank you!